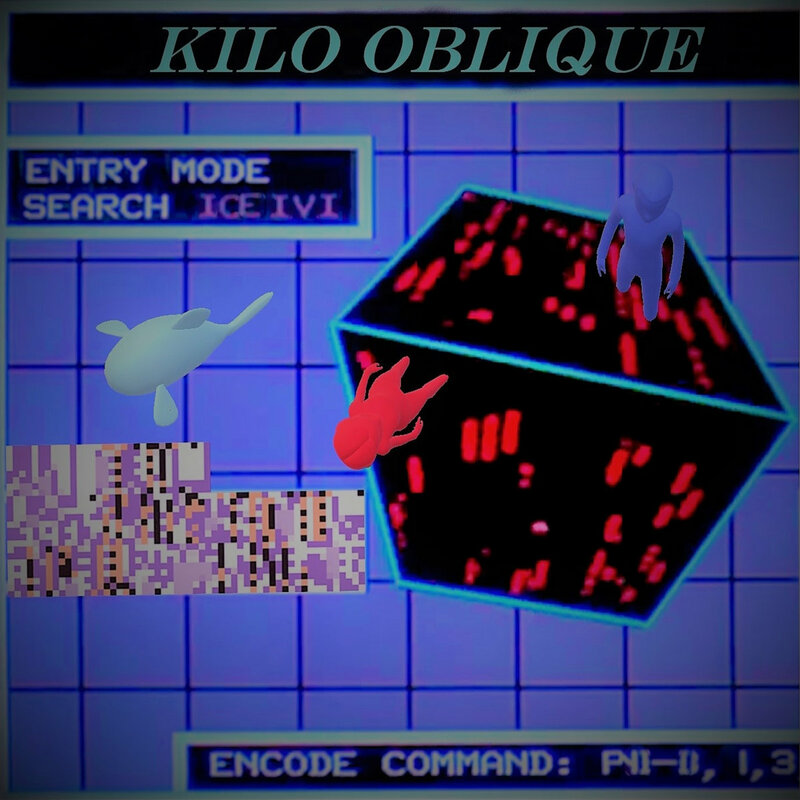 お姉さん M-14’s latest release entitled Kilo Oblique on Seikomart is an ambitious piece of hypnagogic drift. The sample-based compositions are quite dark in tone, shrouded in a dense claustrophobia that envelops the listener like a spectral fog and carries them off to a haunted fever dream. The surreal world that this album inhabits is influenced by the creator, お姉さん M-14’s, real life experiences working as a nightshift shelf stacker at a suburban supermarket. As someone who has had the pleasure of experiencing this lifestyle for themselves I can attest, the 20 tracks which comprise this album convey the intense hypnogogia of nightwork beautifully. The intricate textures on each track evoke a feeling of dislocation and displacement – symptoms of living in the inverted world of nightshift. An isolated world drowned in artificial light where the streets are always empty and the only noises you hear are the voices inside your head. Voices that are muffled, barely audible and completely unintelligible as they bubble up out of your subconscious. This album paints a visceral sonic portrait of that world. Kilo Oblique’s sublime sense of atmosphere is rendered in ghostly trails of reverberant sound that skitter out across space and collide with deep drone notes dissolving into a soupy ambient drone. The result is a profoundly immersive listening experience. A soundtrack to the dissociative symptoms of chronic sleep deprivation, お姉さん M-14’s work is a gloomy red eyed odyssey into deepest darkest night that taunts the listener to try and remember the daylight which at 3 am seems so impossibly far away. Structurally, the music presented on this release is based on the hypnotic drag of repetition that draws the listener into a trance-like state. An aural simulation of menial labour which communicates the sensation of performing an action again… and again… and again… and again… until you barely need to be conscious to do your job and your mind starts to wander. The deeply layered sound design feels like a dream within a dream which drifts deeper into itself, leaving reality further behind and escaping into its own distorted imagination. A window into the mind of its creator, Kilo Oblique is like a cyberpunk panorama painted by Hieronymus Bosch, a swirling sci-fi phantasmagoria realised effectively through the clever curation of samples. The tracks draw together alien synths reminiscent of Vangelis or early Tangerine Dream, shimmering guitars and delicate piano lines all smeared over off-kilter mechanical beats resulting in a record which is at once diverse and cohesive. Sounds ranging from the twisted J pop and menacing industrial clang of the opening track Dial-Tone of an Eternally Falling Football Phone to the dreamy hopeful nostalgia of Traffic 窓の外に — Pt. III combine a wide range of contrasting musical styles that take the vaporwave aesthetic off in unexpected directions. Tracks like P A R T Y S O V E R and プラスチックじょうろ — Pt II, for example, incorporate elements of shoegaze and dream pop into the mix with washes of heavily processes guitar spilling over the atmospheric electronics. Elsewhere, 満足 Blvd lightens the mood with an optimistic groove rooted in electro funk. A standout track which is complemented by the bouncy hip-hip feel Halloween 1989. There is even an odd bossa nova beat on the David Lynch-esque track 一人で運転する The Party. However, as diverse as this sound is, the thing that truly makes Kilo Oblique a unique listening experience is its subversive edge. There is a destructive force woven into the fabric of each of these tracks threatening to obliterate the trance inducing bliss of repetition. Each song is programmed to self-destruct. Sometimes disintegrating slowly over time as loops are gradually overwhelmed by increasingly pervasive effect processing – melodies drowned by reverb, notes tripping over their own feet as delay times shift. And at other times, the whole internal logic of a track is violently disrupted by edits which chop between ideas without warning. The sound of a tape rewinding spliced right into the middle of deep atmospherics jarring the listener with a momentary burst of lounge jazz before screaming off in another direction all together. Also, extreme phasing and filtering are used as weapons against the song structures, picking up entire sections and throwing them around mercilessly before they crash back to the ground leaving the listener disorientated. And then, when it is all said and done, many of the tracks stop cold – no fade out, no coda, just cut to the next track without even letting the reverb and delay trail out. It is brutal and unceremonious but effective and makes the listener pay attention. My only criticism is that, at times, the destructive games become a little predictable. There is definitely a bit of a formula at work here which lessens the impact by creating the expectation that everything will inevitably dissolve into chaos. In many ways, it could have been more subversive to let some tracks to play out straight without any weird disruptions hence sabotaging the expectation of inevitable sabotage. This however is not a big issue and does not detract from the enjoyment of what is an otherwise highly original and imaginative concept album.